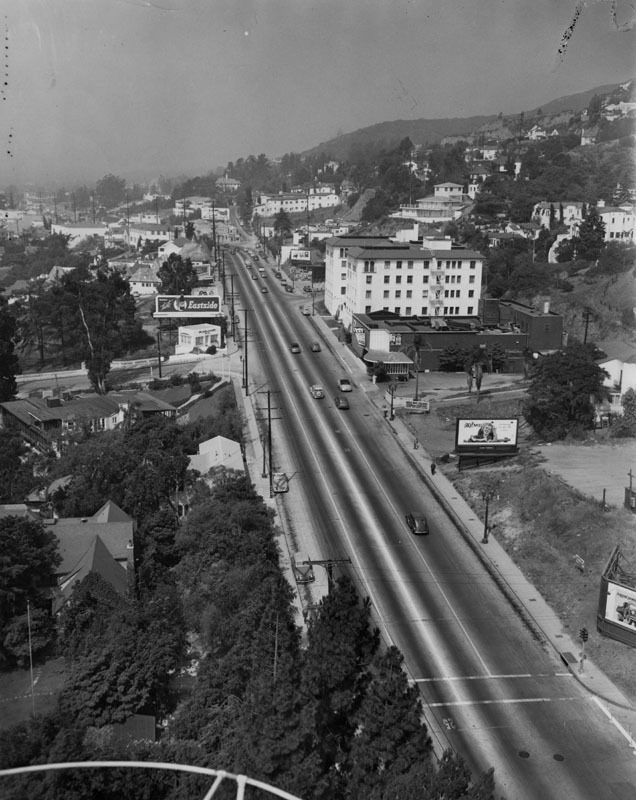 Sunset Boulevard snaked its way from the historic Plaza district of downtown Los Angeles through Hollywood and Beverly Hills and down to the Pacific Coast Highway. The section that came to be known as the Sunset Strip covers less than two miles or roughly 15 blocks, but its boundary was elastic. 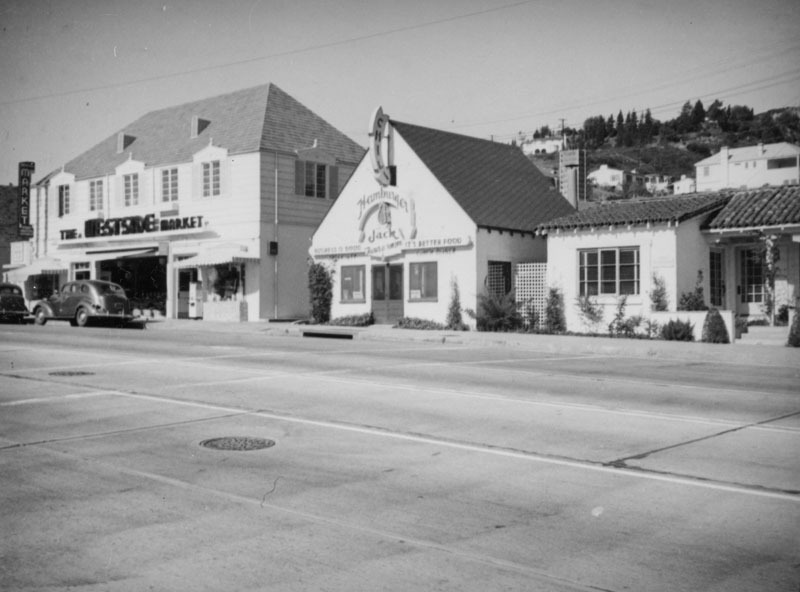 Writing for Esquire in August 1961, Bernard Wolfe states that geographically, the Strip began at Switzer Boulevard, but institutionally it was anchored at Schwab’s drug store near Crescent Heights. The western end was considered to be Doheny Road, near the Beverly Hills city limits, where the bridle path once began in the median. The future Strip was sparsely developed at first, consisting mainly of private residences and roadhouse-type eateries like the Nut Kettle and Hamburger Jack’s, back when the area was know as Sherman. Commercial development increased in the mid-1920s. 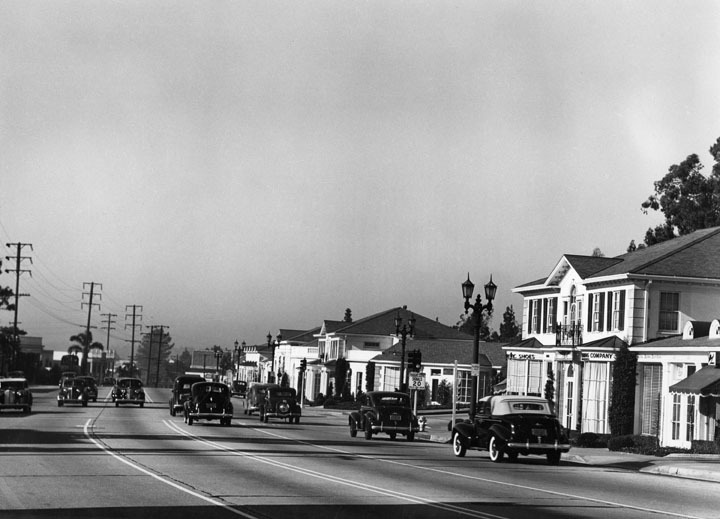 In 1924 a mini-development called the English Village shoppes opened. 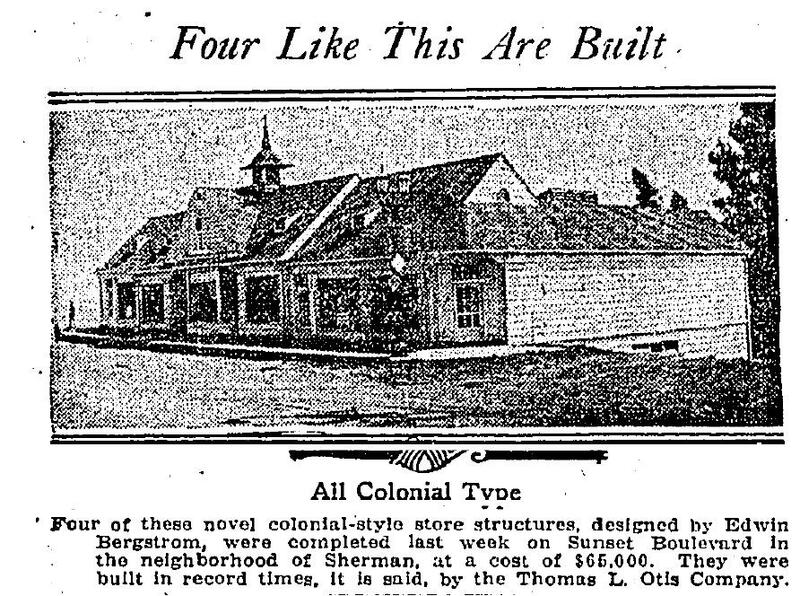 In the same section, the following year architect Edwin Bergstrom designed four low-slung neo-colonial style buildings, one of which came to house a nightclub/speakeasy called La Boheme. In 1926 film star Alla Nazimova began adding bungalows and a pool to her sprawling property near Crescent Heights and opened it as the Garden of Alla Hotel. 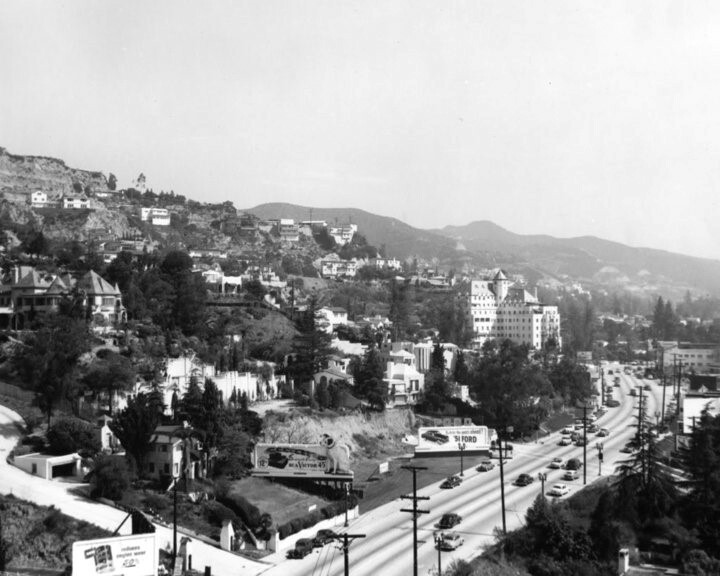 The Chateau Marmont hotel opened up in 1929. Alla Nazimova’s Sunset Blvd. home became the Garden of Alla Hotel. The “h” came later. Hamburger Jack’s in the 9000 block next to Westside Market (9009 Sunset) had been operating since the late 1920s before the strip was The Strip. Seen c. 1937. LAPL. 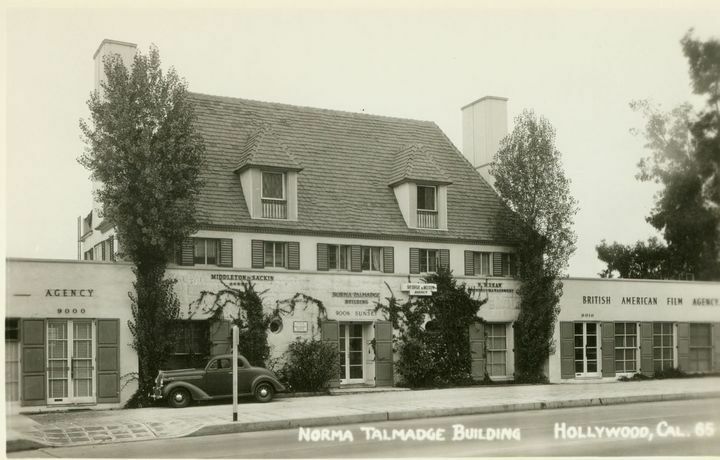 Built in the French style as an architect’s office and residence, the Price Building (later Norma Talmadge Building) at 9000 Sunset Blvd. was replaced by a 15-story building in 1963. Scheuer credited talent agents Victor Orsatti and Milton Bren for sparking the Strip’s popularity when they opened a new office at 9000 Sunset, a location convenient to clients on their way home to Beverly Hills from work at the nearby studios. The opening of several nightspots in the vicinity at roughly the same time, places popular with the movie crowd like Café Trocadero (in the former La Boheme), Café Lamaze, Queen (later Villa Nova) and the Kings, also factored in. The boom of the mid-1930s added blocks of big white, colonial-revival structures adding to an already eclectic architectural mix of Mediterranean, Normandy, Spanish-colonial, Tudor, and streamline-moderne styles (if not a combination of two or more). 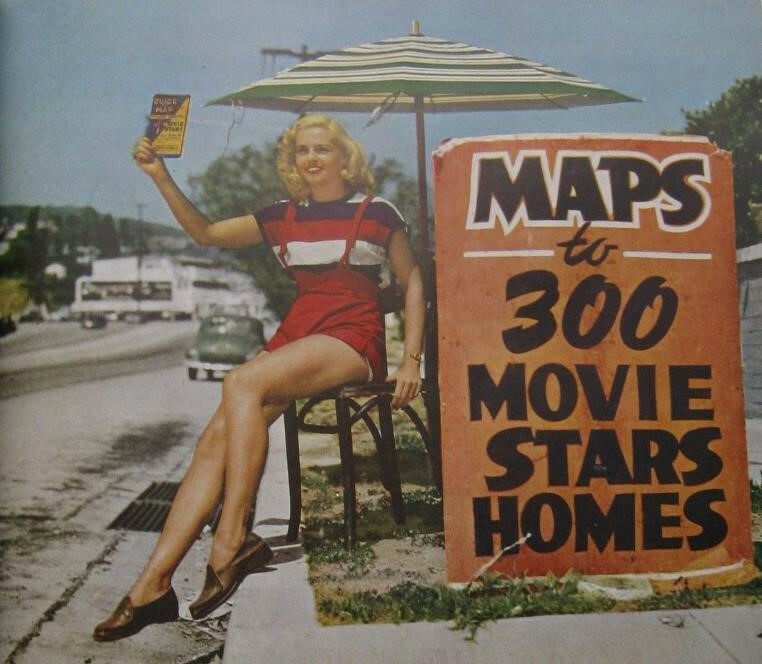 Tourists who came to the Sunset Strip hoping to see the stars at play could also tour adjacent Beverly Hills, where the stars lived, with the aid of a handy map or guide. The streamline-moderne Berman Furs Building can be seen in the distance. Holiday magazine, 1949. Gambling had been a part of the Strip’s lure since the 1920s. 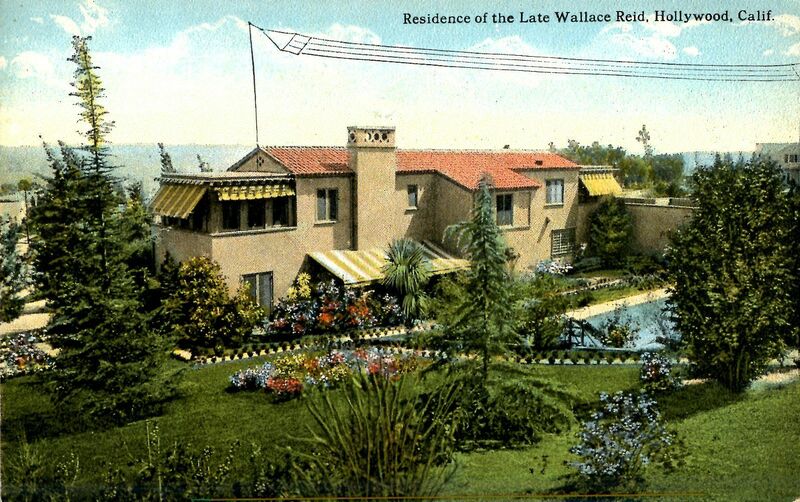 In the 1929, prominent local underworld figure Homer “Slim” Gordon briefly operated a gambling club in the former home of the late actor Wallace Reid at 8300 Sunset (8327 de Longpre). 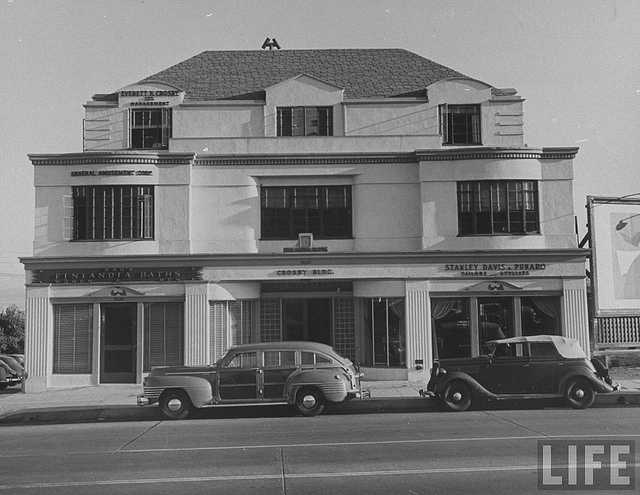 Les Bruneman managed a club at 8428 Sunset in 1930 at the time he was mixed up in the kidnapping of bookmaker Zeke Caress. Gambling figures George and Bob Goldie, Milton “Farmer” Page,” Eddie Nealis and others operated a casino out of a former private home at 8477 Sunset, later known as the Clover Club. George Goldie would operate the Trocadero in the 1940s, when it was rumored to have illicit gambling rooms. 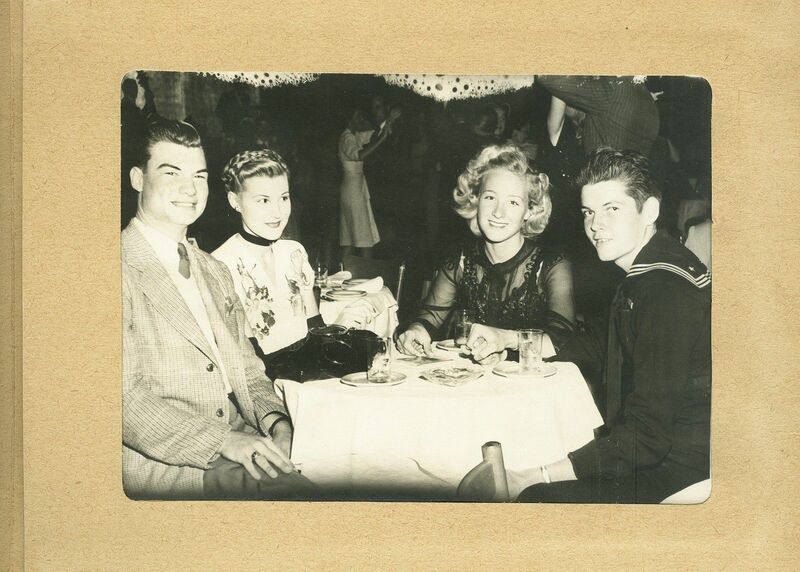 Nealis also briefly operated an illegal gambling club at 9216 Sunset, which featured in a notorious robbery involving Betty Grable and other celebrities on New Years’ Eve, 1945. 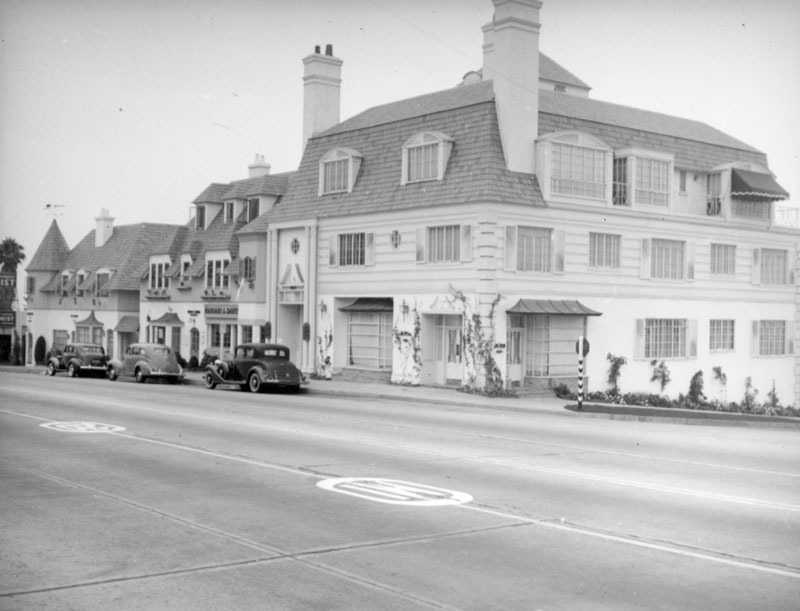 The mansion of the late Wallace Reid, 8300 Sunset, used for a few days in 1929 as an illegal gambling club without the knowledge of Reid’s widow who thought she was leasing the property to a “wealthy oilman.” The property was replaced by the Thunderbird Inn in 1961. At the peak of its popularity in 1941, the Strip tried to promote itself as a place to visit day or night. “The Sunset Strip invites you…for leisurely shopping daytimes and evenings… away from the city’s crowds and noise and traffic…for the playtime of your life at world famous nightclubs…visit the Sunset Strip TODAY and TONIGHT.” Day shoppers and browsers could find art galleries, furriers and clothing boutiques, jewelers such as Paul Flato, antique dealers and decorators-to-the stars like Billy Haines at 8720 Sunset and Gilbert Adrian at 8606, and Elizabeth Arden’s Los Angeles salon at 8597. Diners had their choice of a variety of international cuisine, including Swedish smorgasbord, Russian, Hungarian, and English. 1941 ad for C.H. 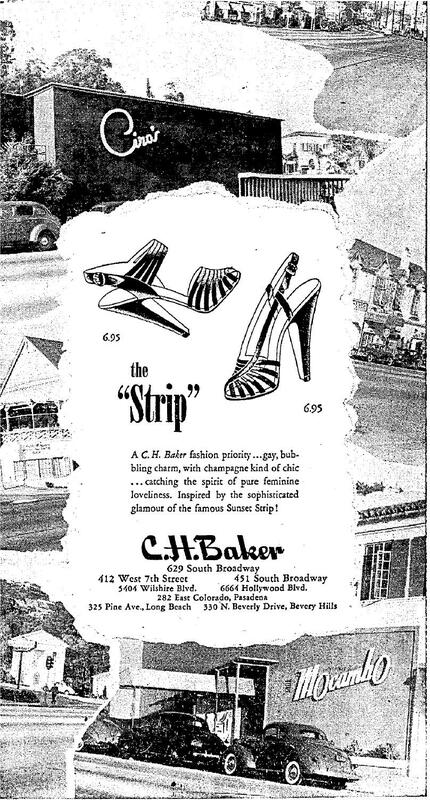 Baker shoe stores promoting a line of ladies footwear “inspired by the sophisticated glamour of the famous Sunset Strip.” Featured prominently are Ciro’s, Bit of Sweden, Mocambo and Sunset Plaza. 10-20-1941. During the war years, nightclub attendance on the Strip swelled. Service personnel with cash to burn enjoyed visiting the famous nightclubs they’d previously only read about. Club managers coped with rationing as well as curtailed closing hours, from 2am to 12am. The sheriff’s office was kept busy raiding clubs who stayed open after hours or operated without a valid liquor license as a so-called private “bottle clubs” (where ostensibly the proprietor’s sold no alcoholic beverages but merely served liquor provided by “members” for their personal use). Another night, another raid. The Strip is bored when sheriff’s deputies raid The Kings Club, 9039 Sunset (the onetime Cafe Lamaze and future Sherry’s), July 8, 1943. 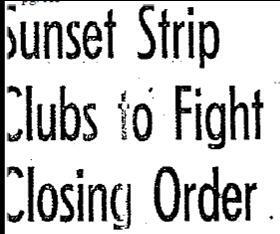 The Sunset Strip’s four most prominent nightclubs- The Clover Club, Trocadero, Mocambo, which had their licenses suspended for 15 days for violating the midnight closing, fought the order in December 1944, arguing successfully in court that only the State Board of Equalization (then in charge of managing state liquor laws) had the authority to decide closing hours. While the unpopular midnight closing was temporarily lifted, a new midnight curfew went into effect February 26, 1945. In 1946, with the lifting of wartime meat and gas rationing (and curfews) and an influx of returning veterans, the Strip enjoyed another boom. But with Bugsy Siegel, who many believed had taken control of the local gambling rackets in 1938, now spending more of his time in Las Vegas overseeing the building of the Flamingo Hotel and Mickey Cohen rising to prominence in the Los Angeles underworld through elimination of his rivals (1), things were changing on the Strip. Both the Trocadero and the Clover Club closed during this time. Cohen opened a haberdashery on the Strip in a former nightclub at as a front for his racket operations. It was here in August 1948 that henchman Harry “Hooky” Rothman was shot to death in what was thought to be an attempt on Cohen’s life. “The county strip, which people are referring to more and more frequently, has nothing to do with rural burlesque” Times columnist Philip K. Scheuer wrote in 1935. 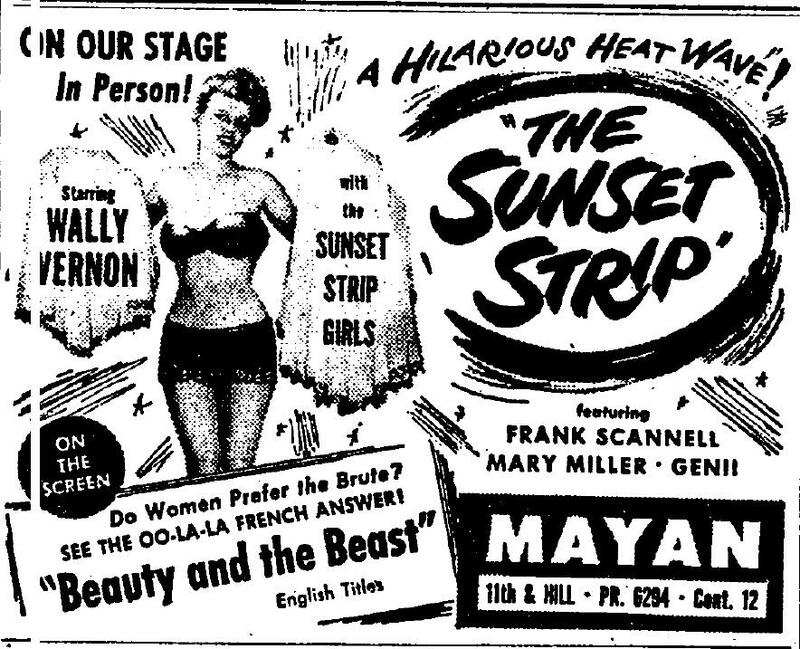 The perhaps inevitable Sunset Strip, the burlesque came along in November 1948 at the Mayan Theater. 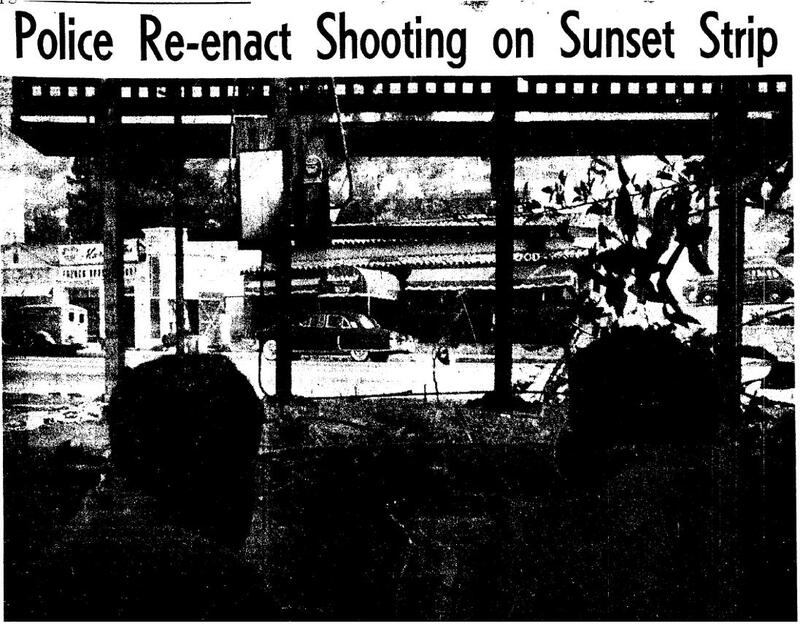 In July 1949, there was another shooting on the Sunset Strip, which the paper soon dubbed The Battle of Sunset Strip. The shots were fired at Mickey Cohen as he left Sherry’s restaurant, 9039 Sunset. As Café Lamaze, it had been one of the nightspots credited with helping turn the rural county strip here into the glamorous Sunset Strip in 1935. The assassins missed Cohen but killed another of his henchman, Edward “Neddie” Herbert. Columnist Florabelle Muir and actress Dee David of Cohen’s party were wounded as was Harry Cooper, Cohen’s state-appointed bodyguard, assigned to Cohen only the day before by Attorney General Fred Howser (who’d left office as L.A. County D.A. in 1946 to take the job). 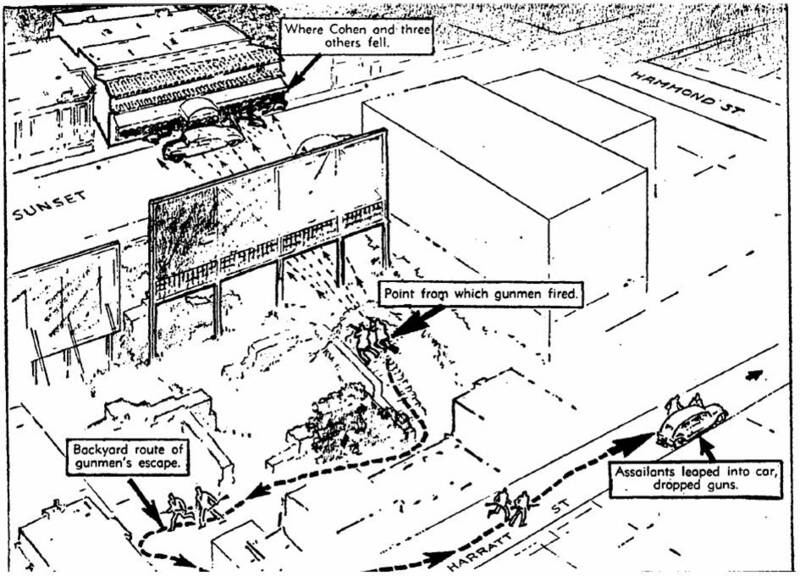 Los Angeles Times artist Charles Owens sketched this diagram of the Cohen shooting outside 9039 Sunset Blvd.. 7-21-1949. The gunmen gunning for Cohen waited behind billboards on a vacant lot adjacent to the Crosby Building. 7-21-1949 LA Times. The Strip lost none of its cache over these brushes with notoriety. Mocambo and Ciro’s were as popular as ever through much of the new decade despite increasing competition with Las Vegas for customers and talent. New modern apartments cropped up along the thoroughfare, like the half-round Villa Capri at 8341 Sunset in 1953, and the Sunset Towers West at 8400 Sunset in 1956, so more people could live where they played. Casual dining spots opened, such as Hamburger Hamlet at 8931 Sunset and Ben Frank’s at 8585 Sunset. “77 Sunset Strip,” a television show about an L.A private detective that aired from 1958 too 1964, also helped increase the profile of the thoroughfare at a national level. 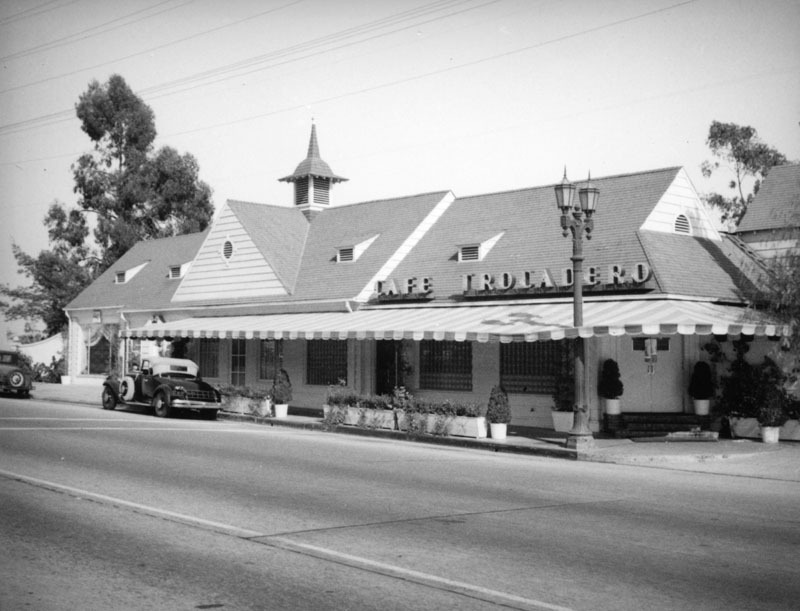 The Thunderbird Inn, 8300 Sunset Blvd., built on the site of the Wallace Reid mansion in 1961. The semi-circular Villa Capri Apartments at 8341 Sunset Blvd., built in 1953. 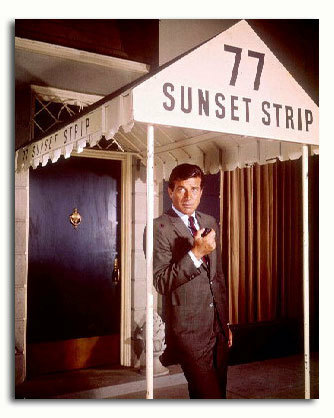 The address 77 Sunset Strip was fictional. It was filmed at 8524 Sunset Blvd., formerly Ruth St. Denis’ Asia Bazaar, then Charocka Russian restaurant, and finally Dino’s Lodge. In the 1960s, the look of the Strip started to change with increased high-rise development. Youth culture moved in as well with the opening of teen dance clubs. 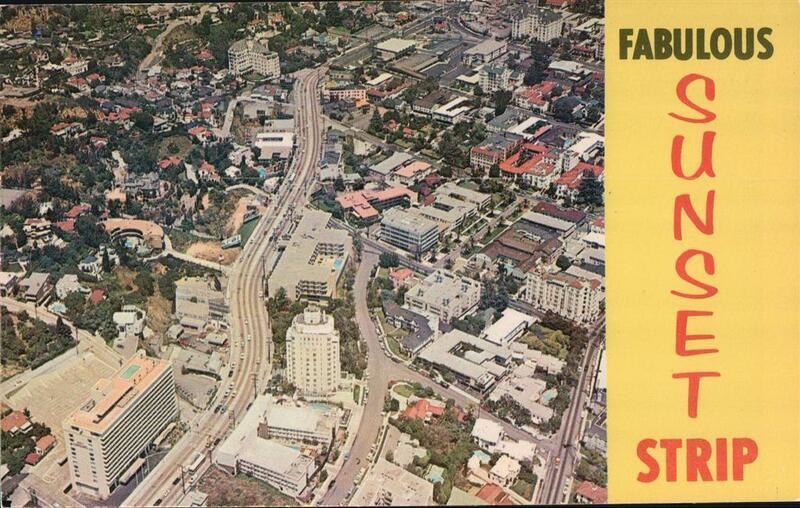 The image of the Strip as a glamour spot declined but as “hippies” moved out and chic boutiques moved in, by the early 1970s, longtime tenants were hopeful of a Sunset Strip renaissance. (1) Cohen admitted slaying rival bookie Max Shaman in May 1945 at his bookie joint (8109 Beverly Blvd. ), claiming self defense. In May 1946, Paul “Paulie” Gibbons, who had been arrested with Cohen in November 1945 at Cohen’s “social club,” (126 N. La Brea), was slain execution-style in Beverly Hills. Cohen was questioned but not held. In October 1946, Benny Gamson, also questioned in the Gibbons case, and Chicago hoodlum George Levinson were shot to death in another gangland-type execution in Hollywood. Siegel himself was murdered in June 1947.